To earn the Bobcat rank the new Cub Scout must complete the requirements for the Bobcat Badge. 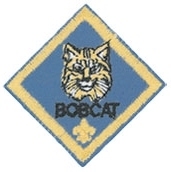 The Bobcat Trail is outlined at the beginning of every handbook in Cub Scouts. Once completed and reported to your Den Leader, the Bobcat Badge will be awarded at the next Monthly Pack Meeting. Beginning June 1, 2015, Wolves will need to complete a total of seven adventures to earn their Wolf rank badge. Six of these are required. The den or family can select the last adventure from 13 electives. The required adventures are: Call of the Wild, Council Fire, Footsteps of Faith, Howling at the Moon, Paws on the Path and Running With the Pack.